We live in North Idaho. For the past few months we have had a very young male moose on our property. Not sure if something happened to momma or this is his first year on his own. But he is here almost every day eating on our trees. Well one day we went outside and he was on our porch. He stayed there the whole day. Great shot Diane! 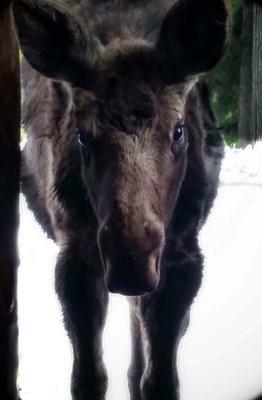 Thank you for sharing this cute photo of your baby moose!